Welcome back! 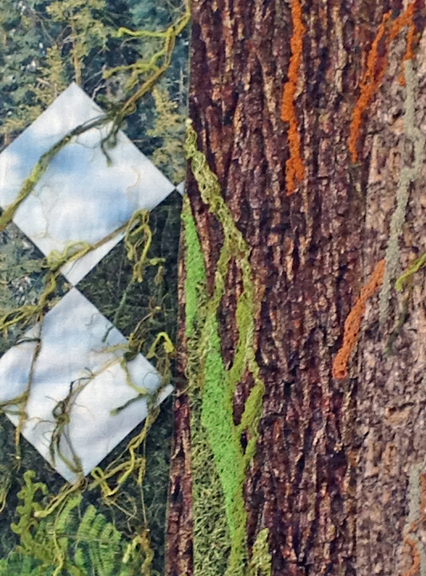 Did you miss my previous 2 posts about Embellishing my Old Growth quilt? First instalment about Bobbin Quilting is here. 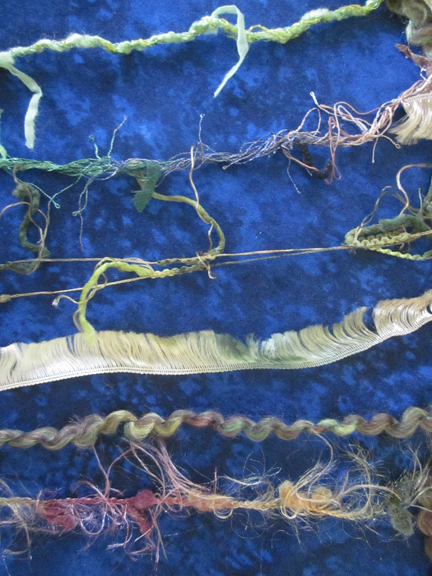 Second instalment about Couching Thick Threads is here. Here again is the completed quilt. 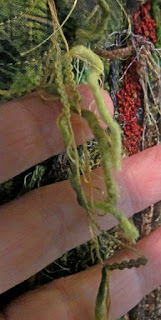 In this final post I will be sharing how I use fuzzy threads - they can't go in the bobbin and if I use them in my Free Motion Couching foot they just get 'squashed down' and all the fluffy-ness is gone. 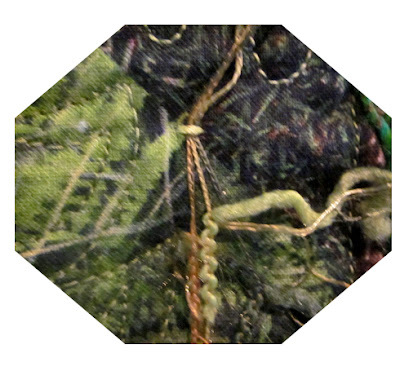 The left edge of this photograph shows the fuzzy threads. This picture shows the type of threads I'm talking about toda. It s the wonderful texture of these threads that made me buy them in the first place! Notice how the top thread and the third thread have an area of fairly even thread and then there is an amazing thread hanging from that thread! That's the part I LOVE and I was determined to figure out how to use them. These are knitting yarns - yes, check out your local yarn store for some amazing embellishment threads! "In hand embroidery, couching is a technique in which yarn or other materials are laid across the surface of and fastened in place with small stitches of the same or a different yarn." That's what I needed to do. Fasten the fibres at intervals with some sort of stitches! I set my machine for a zigzag stitch, wide enough to cover the main part of the fibre. This is fairly narrow for the 'hanging thread' type fibres. If you use wider threads you need to set the machine to cover the main part of your fibre. In some cases it might be fairly wide. I dropped the feed dogs which meant that the zigzag would just stitch on top of itself - like a 'BAR TACK'. That's exactly what I needed to do. This is a slower process but very effective. 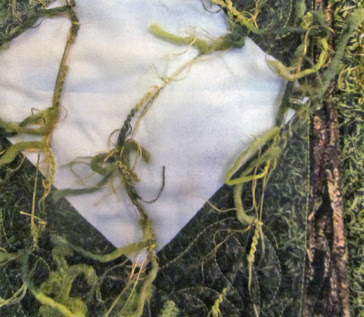 I used a machine sewing thread that would blend with the fibres, placed the fibres where I wanted them and stitched a 'bar tack zigzag' over the threads. Then I just moved to the next place without cutting my top and bobbin thread and tacked the fibres in place again. Here's a closeup picture. I held 2 threads together for this thread so I could get more of the hanging part onto the quilt. And this is the area of sky where I wanted to show moss hanging from my trees. In several areas I left the threads hanging loose. That's my hand under the threads so you can see what this looks like. There is a bar tack above my hand, but no tacking below. That's the final instalment for my Embellishment series....until I make some more discoveries! I hope you have learned how you can use thick, fuzzy and fluffy threads to embellish your quilts. 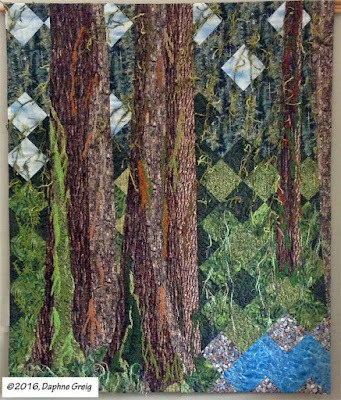 I'd love to share pictures of YOUR quilts. Click 'Contact' at the top of the page to send them to me.